Many homeowners are trending towards updating their brick fireplaces by installing a veneer of tile or a natural stone onto their fireplace surrounds. Even though virtually all newer homes are constructed with efficient central AC and heating systems (HVAC systems), there is still nothing that quite matches a blazing fire on those long cold nights. Maybe its a leftover primitive comfort instinct that survived from our caveman days. Fire represents warmth, a place to cook the daily kill, and a method of warding off predatory beasts. Of course weve got to have a fireplace mantle to hand Christmas stockings. But besides that, home décor styles seem come and go. Many homeowners lately seem to prefer paint, ceramic tile, or even a natural stone like marble on their surround instead of Acme brick. Thinset mortar. Although regular mortar is fine for horizontally-laid floor tile, thinset is a better choice for vertical surfaces. Latex thinset mortar additive. You can choose to use this amendment or not but its recommended. It provides a superior bond. Ceramic tile spacers. These are essential to achieve a laser-straight grout line. Tile. You can buy tile at any home improvement outlet or at a specialty store where you will find a better selection. Grout. You can buy grout in a number of colors, dry or pre-mixed, and sanded or non-sanded. As a general rule, use non-sanded for a 1/8 tile spacing and sanded for anything wider than that. 1 X 2 boards. You will use these to shore up your bottom course on your firebox opening as well as your lower border tiles. A finishing trowel and a notched trowel. A saw; circular saw, table saw, or hand saw. Hammer drill with masonry bit and Tapcon masonry screws. A diamond blade wet saw. Your tile needs a smooth, flat surface to stick to (not surprisingly). It follows that it is important to eliminate any voids. This will maximize adhesion and give a more professional result. Note: Although in all the steps below I address only the front of the surround for the sake of brevity, it all applies to the sides as well. Mix a sufficient amount of thinset with the latex mortar additive to cover your surround surface. I like to use a high quality electric drill, not one of those cheap ones, and a paddle bit or ribbon mixer. Use your finishing trowel to spread a layer of thinset over the brick exterior of the surround. Take your time and have patience because the surface is always uneven, especially when your brick mortar lines are deep. Allow time for the thinset to cure. Expect this to be at least overnight, maybe as long as 24 hours. Check the surface with a 4 level or some other straightedge. Repeat the process until the surface is smooth and flat. 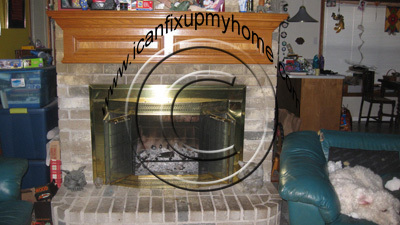 Cut your board the width of your fireplace surround adding an extra 1 on either side. Hold the board horizontally spanning your firebox opening. Use your 4 level to align the top of your board to the top of the firebox opening. Draw a reference pencil line on the thinset along the top of your board. Use your drill with a screw-tip, attach the board with Tapcon masonry screws. It really helps to have a assistant while performing this step. This depends on the width of your fireplace, your tile spacing, and the width of your tiles. You can center a tile or a grout line on your surround; either way will give you equal borders. First, prepare a thinset and latex additive mixture as you did earlier. Spread the mixture with your notched trowel from the top of your supporting ledge upwards. Dont actually touch the ledge; start a quarter of an inch above it. Begin at the center of your firebox and lay the initial course from the center and work outwards using your tile spacers between tiles. Use a diamond blade wet saw to cut the border tiles. Install them. Apply the rest of the courses upward. For visual effect, you can either keep the vertical grout line continuous or you can center the tile in the next course over the previous vertical grout line. Measure, cut, and set the top border tiles. Unscrew and remove your support ledge. Now youll need to carefully measure down from the bottom of the installed tiles to the floor, taking into account the height of the tile and the thickness of the spacers, to determine the size of the bottom border tile. Cut and install a 1 X 2 ledge in place of the bottom borders. Mix and apply thinset as youre used to doing by now. Again, be cautious not to get any on your support ledge. Now set your tiles, starting at the top down going down, following the continuous or alternating pattern that you used above. Let your thinset cure, remove your supports, trowel out some thinset, and then cut and set your bottom borders. And last but not least, apply grout to the fireplace. Once it has dried, its a good idea to apply a high-quality grout sealer.